Do not miss another Suit Direct voucher! 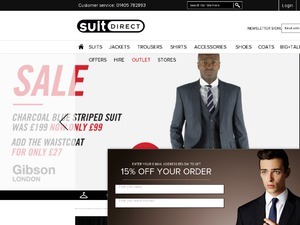 Simply leave your e-mail address and we'll always keep you informed of new vouchers for Suit Direct. Offer condition: Excludes Flash sale. Offer condition: 10% off applies to new customers only. Offer condition: Extra 15% off applies to items included on the URL only. 10% discount on new season! Offer condition: 10% off all new arrivals with the use of SPOOKY. Welcome to Nando's. The official worldwide home of Nando's famous Peri-Peri chicken.